Anyone dealing with a medical condition needs to be vigilant when it comes to their health and safety, and medical bracelets play an important role in this process. If you’re coping with any kind of disease, illness, or other medical condition, a bracelet that identifies you and your needs can save your life. Try a metal bracelet that has your information engraved. These bracelets not only look fashionable, but they also contain pertinent information that someone might need in the event of an emergency. This type of ID bracelet should be engraved with your name, condition, and an emergency number that someone can use to. al bracelet has gotten a makeover. Some styles now include a built-in USB flash drive that can hold several gigabytes of information. Download your medical history, contact information, and any other important info that you feel will be essential to share with someone if you have a medical-related emergency. They can easily access it at a hospital, emergency room, or clinic to get a complete snapshot of your condition. When choosing personalized medical id bracelets, make sure you include plenty of information. Your name, medical condition, contact numbers, medications you may need, and any allergies you have are all great things to include, where applicable. The more information you can provide, the better your chances of survival if something were to happen. 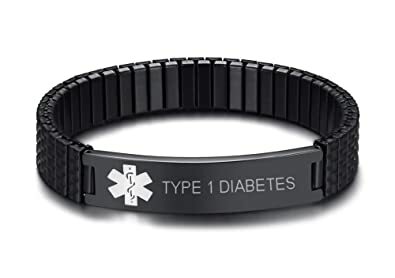 Whether you have a child with peanut allergies, your parent has diabetes, or you have a specific condition, your medical ID bracelet can still look stylish and attractive. With a wide range of designs to choose from, there are plenty of attractive options available. Most people may not even know you’re wearing a medical bracelet unless they look closely, so feel free to shop around and find one that’s not only functional but also looks great. From a dizzy or fainting spell to a life-threatening situation, medical ID bracelets have long been a reliable way for others to help those in need. Wear yours daily if you deal with a serious condition so that others can help you in an emergency. By including all of the important information, you’ll be much more confident that you or a loved one is safe in a variety of situations.